Imagine this. Within a week, for a few dollars, you could be joining the ranks of those who grow their own food at home. You could be growing your own major protein source and only have to give up jar space on a kitchen bench to do it. Sprouts vary in tastes and textures. You can experiment with types and recipes whilst significantly improving your diet. Most health food shops sell sprout mixes which are ideal for beginners learning how to sprout beans. Usually these mixes are targeted towards salads or stir-fries. It’s cheaper to buy beans separately and in larger amounts from bulk bins in health food shops, co-op stores or from internet suppliers. Shopping online usually enables you to select from a greater variety of sprouting beans like those pictured below. Each has it's own unique texture, flavour and nutritional profile. 1. Get a large, clean glass jar. 3. Make a lid for your jar from a stocking, mesh or a tea towel, and secure it with an elastic band. 4. Cover the beans with water and soak. For soak times see the instructions for specific beans below. 5. Rinse and drain them well. 6. Leave your sprout jar on a bench top out of direct sunlight, upside down at an angle so that the water completely drains. 7. Following their initial soak, rinse and drain your sprouts regularly. The number of rinses necessary per day for different bean types is outlined below. 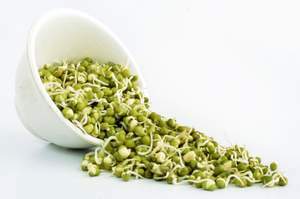 I’d recommend sprouting mung beans to start with because they’re crunchy and fresh-tasting, and if you harvest them while their tails are short (1-2cm) they are even sweet. Soak for 8-12 hours and rinse 2-3 times a day. Harvest after 3-5 days at 1-5cm length (shorter ones are sweeter.) Eat raw or cooked in salads, sandwiches, stir-fries, smoothies or as a snack. Soak for 4-6 hours and rinse 2-3 times a day. Harvest after 5-6 days at about 4cm length. Eat raw in salads and sandwiches or as garnish. Soak hulled seeds for 8 hours and rinse 2-3 times a day. Harvest after 1-3 days at about ½ -2cm length. Eat raw or cooked in salads, stir-fries or dips. Soak for 10-12 hours and rinse 3-4 times a day. Harvest after 3-6 days at about 2-4cm length. Eat raw or cooked in salads, sandwiches, stir-fries or dips. Soak for 8-10 hours and rinse 3-4 times a day. Harvest after 2-5 days at about 1-4cm. Eat raw in salads, sandwiches or as garnish. Soak for 5-6 hours and rinse 3-4 times a day. Harvest after 1-3 days at 1-2mm. Eat raw in salads, stir-fries, dips, smoothies and dehydrated crackers. There are several different types of sprouters that you can use for sprouting. The jar method is a cheap and easy place to start when you're experimenting. Once you want to increase the volume of sprouts you produce tray sprouters and automatic sprouters become more useful.